The year 4, quarter 1 public data release for the iBOL project was published on October 25, 2013. This release is now available on the BOLD site as a dataset, and released into the BOLD Public Data Portal. The data release includes records for 155,151 specimens analyzed at the Canadian Centre for DNA Barcoding at the University of Guelph and the Centre for Environmental & Molecular Algal Research at the University of New Brunswick during the first year of iBOL ramp-up (July 1, 2009 - June 30, 2010) and the first 39 months of the officially activated iBOL project (July 1, 2010 – June 30, 2013). Included are COI, MatK, and rbcL sequences, identifiers, ordinal taxonomic information, country and GPS data, and other specimen details. The year 3, quarter 4 public data release for the iBOL project, published on July 15, 2013, marks the 3 year point for the official iBOL project. This release is now available on the BOLD site as a dataset, and released into the BOLD Public Data Portal. The data release includes records for 116,552 specimens analyzed at the Canadian Centre for DNA Barcoding at the University of Guelph and the Centre for Environmental & Molecular Algal Research at the University of New Brunswick during the first year of iBOL ramp-up (July 1, 2009 - June 30, 2010) and the first 3 years of the officially activated iBOL project (July 1, 2010 – June 30, 2013). Included are COI, MatK, and rbcL sequences, identifiers, ordinal taxonomic information, country and GPS data, and other specimen details. 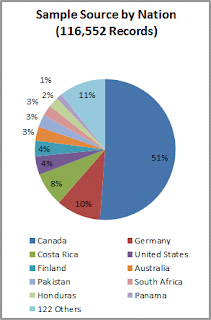 The year 3, quarter 3 public data release for the iBOL project was published on April 15, 2013. This release is now available on the BOLD site as a dataset, and released into the Barcode Data Commons. 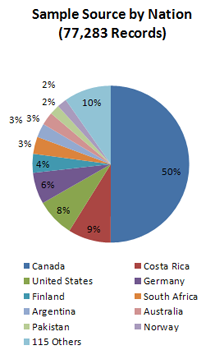 The data release includes records for 89,038 specimens analyzed at the Canadian Centre for DNA Barcoding at the University of Guelph and the Centre for Environmental & Molecular Algal Research at the University of New Brunswick during the first year of iBOL ramp-up (July 1, 2009 - June 30, 2010) and the 33 months of the officially activated iBOL project (July 1, 2010 – March 31, 2013). Included are COI, MatK, and rbcL sequences, identifiers, ordinal taxonomic information, country and GPS data, and other specimen details. 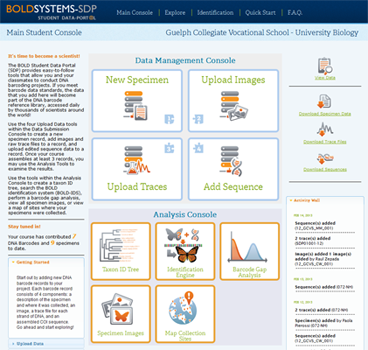 We would like to announce the launch of the BOLD Student Data Portal (SDP), an educational version of the BOLD Workbench designed for K12 and undergraduate classroom environments. 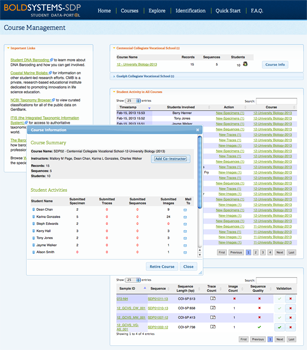 SDP is a module in BOLD that exposes students to the database and analytical tools used by professional researchers via simplified interfaces. The SDP software provides additional features beyond the BOLD Workbench including tools for monitoring student progress and validation of student work. A critical aspect of the system is that data generated by students undergo multiple screenings before publication ensuring fitness for use in secondary research. 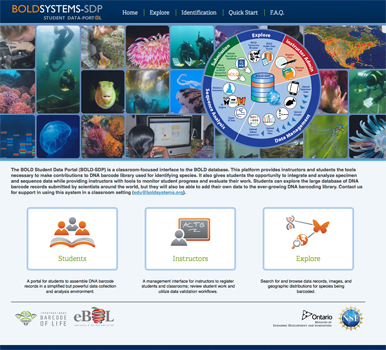 BOLD-SDP permits student users to upload specimen data, collection event details, images of specimens, trace files generated through laboratory processes, and edited nucleotide sequence data. It provides an integrated suite of analytical tools that enables students to visualize the relatedness of specimens by building a neighbour joining trees, validate specimen identifications by comparing their sequence data against barcode records contained in the BOLD data repository using the ID Engine, investigate the distribution of sequence divergence values to detect the presence of barcode gaps (a pattern of sequence divergence indicating species boundaries). Students using the system are given a unique opportunity to contribute valuable data to the scientific commons and gain insights into DNA sequence analysis and data interpretation. 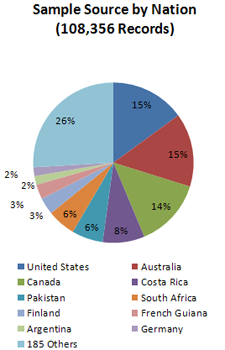 The year 3, quarter 2 public data release for the iBOL project was published on January 15, 2013. This release is now available on the BOLD site as a dataset, and released into the Barcode Data Commons. The data release includes records for 77,284 specimens analyzed at the Canadian Centre for DNA Barcoding at the University of Guelph and the Centre for Environmental & Molecular Algal Research at the University of New Brunswick during the first year of iBOL ramp-up (July 1, 2009 - June 30, 2010) and the 30 months of the officially activated iBOL project (July 1, 2010 – December 31, 2012). Included are COI, MatK, and rbcL sequences, identifiers, ordinal taxonomic information, country and GPS data, and other specimen details. The BOLD Species Identification Engine has been extended by the addition of three new features, BIN integration, accessibility status of matches, and geographical distribution of matches. To address the three levels of record accessibility on BOLD (private, early-release, and published), the ID engine now exposes the status of each record in the Top Matches table. 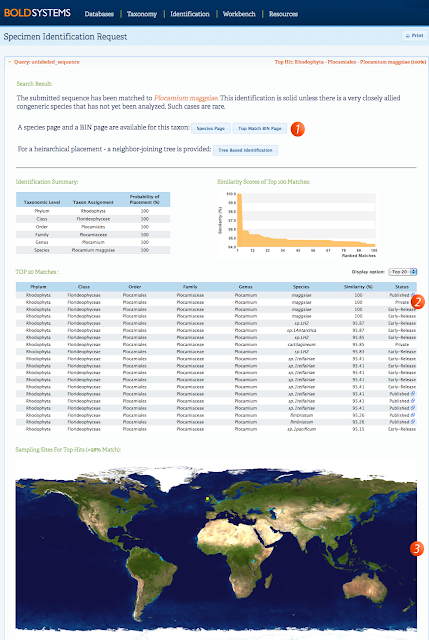 Where a record is published, a link is provided to the specimen and sequence page in the BOLD Public Data Portal. 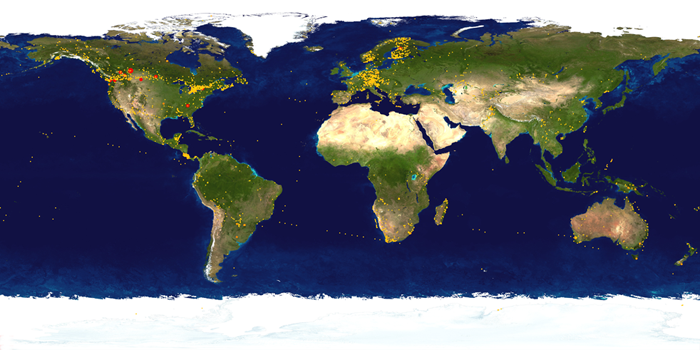 The collection sites of matched specimens are provided in a distribution map. This feature helps to confirm the identification provided if the sample being tested is from the same locale as prior entries. Additionally, it may serve to flag cases of invasive species. 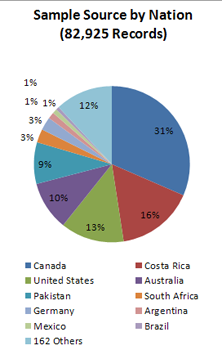 The year 3, quarter 1 public data release for the iBOL project was published on October 12, 2012. This release is now available on the BOLD site as a dataset, and released into the Barcode Data Commons. The data release includes records for 82,925 specimens analyzed at the Canadian Centre for DNA Barcoding at the University of Guelph and the Centre for Environmental & Molecular Algal Research at the University of New Brunswick during the first year of iBOL ramp-up (July 1, 2009 - June 30, 2010) and the 27 months of the officially activated iBOL project (July 1, 2010 – September 30, 2012). Included are COI, MatK, and rbcL sequences, identifiers, ordinal taxonomic information, country and GPS data, and other specimen details. 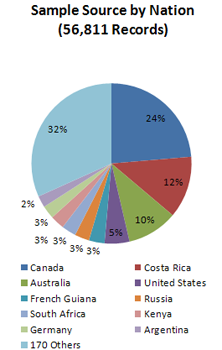 The year 2 quarter 4 public data release for the iBOL project was published on July 13, 2012. This release is now available on the BOLD site as a dataset, and released into the Barcode Data Commons. The data release includes records for 108,356 specimens analyzed at the Canadian Centre for DNA Barcoding at the University of Guelph and the Centre for Environmental & Molecular Algal Research at the University of New Brunswick during the first year of iBOL ramp-up (July 1, 2009 - June 30, 2010) and the 24 months of the officially activated iBOL project (July 1, 2010 – June 30, 2012). Included are COI, MatK, and rbcL sequences, identifiers, ordinal taxonomic information, country and GPS data, and other specimen details. BIN system is only operational for animals. Because many animal species are undescribed, and because the identification of known species is often difficult, interim taxonomic systems have a long history in this kingdom. By assigning individuals to operational taxonomic units (OTUs), they enable studies that would otherwise be impossible. DNA-based systems for OTU delineation are particularly powerful because they can be automated, data are readily archived and results are easily compared among studies. These advantages have provoked the development of an OTU system based on sequence diversity patterns in the barcode region. Results have shown a strong correspondence between recognized species boundaries and those inferred from the analysis of COI sequence variation for groups with robust taxonomy. As a consequence, the Barcode Index Number (BIN) system has now been activated as a key functional component on BOLD3.0. It assigns a GUID to each sequence cluster and agglomerates all information on its members (sequences, images, distributional data), creating an effective proxy identification (e.g. BOLD: AAA3092 below) until the members of a particular cluster are formally assigned to a species (Figure 6). The BIN system is a critical enabler for iBOL research, especially as we probe species diversity in groups that have seen little prior taxonomic attention (mites, nematodes) or those where overlooked species (parasites) are prevalent. Aside from organizing data for undescribed species, the BIN system aids assessment of the validity of existing identifications and the organization of data for barcode clusters from known species that simply await identification. suggesting that the blood meal was accidentally sequenced. Third party annotation is critical for the repair and validation of barcode records. Data consumers often detect taxonomic and geographic errors in public datasets but with no mechanism for communicating with data owners, issues go unresolved. Further, when data producers are unavailable to address inquiries, errors persist. BOLD3 addresses both of these situations by integrating an annotation database into the Workbench, Public Data Portal, and BIN database (Figure 7). The annotation interfaces allow users of BOLD to annotate any records or components of records (i.e. taxonomy, geography, or photographs) with comments and tags. Annotation events are automatically communicated to data owners. Any comment or tag attached to a record or any of its components persist and are visible to all users. in Canada held in the Royal Ontario Museum. The data portal in BOLD provides any visitor with access to all published barcodes and those under early release (~1.3 million sequences in April 2012). Records are indexed on multiple metadata fields allowing for complex queries based on taxonomy, geography, BINs, depositories, and gene codes (Figure 8). Data can be downloaded in portable formats (XML and tab delimited for specimen data, Fasta for sequences, and AB1 for trace files) for any query. Taxonomic, geographic, and depository breakdowns are available and high-resolution distribution maps (30 Megapixel) can be generated from queries supporting data mining and meta-analysis. selected on the image on the left. Plant vouchers often contain many parts of a plant and are pressed in herbarium sheets. Scans of herbarium sheets have been submitted to BOLD for two years, but its image viewer did not provide adequate resolution. A new viewer has been integrated into BOLD3.0 with the plant community in mind. It allows for viewing of the very high-resolution images (70 Megapixel in some cases) generated by the scanners used in digitization processes specific to herbarium sheets (Figure 9). Although designed for plant researchers, the new viewer also allows provides full resolution of images for animal specimens, a feature that will strengthen use by taxonomists. 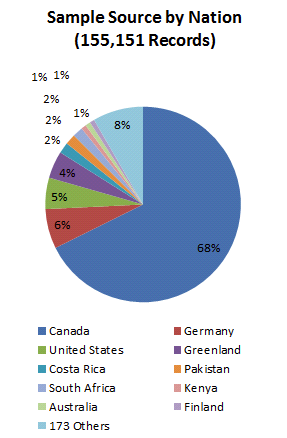 The year 2, quarter 3 public data release for the iBOL project was published on April 11, 2012. This release is now available on the BOLD site as a dataset, and released into the Barcode Data Commons. The data release includes records for 56,023 specimens analyzed at the Canadian Centre for DNA Barcoding at the University of Guelph and the Centre for Environmental & Molecular Algal Research at the University of New Brunswick during the first year of iBOL ramp-up (July 1, 2009 - June 30, 2010) and the 21 months of the officially activated iBOL project (July 1, 2010 – March 31, 2012). Included are COI, MatK, and rbcL sequences, identifiers, ordinal taxonomic information, country and GPS data, and other specimen details.